They came from all over, from Arkansas, Illinois and Italy. Some were handwritten, some were typed. They came on scraps of notebook paper, cheap postcards and fine bond, all with the same request: send info please! I want information on Professional Women Photographers. These letters are more than personal requests; they speak of a time and place and a need, sometimes bordering on desperation. You sense the hunger as they ask, are there more women photographers out there like me? How can I reach them? How can I stay in touch? In the 70′s, when PWP was founded, there was an excitement and energy in the air. Cultural movements that began in the 60′s – desegregation and women’s liberation – were coming to fruition. They weren’t just ideas anymore, they were realities. Colleges were integrating and going co-ed. Women were leaving the kitchen for the corporation, and entering professions that had long been off limits or male-dominated, like photography. There was a spirit of can do and why not? The climate had been set for change and it was happening. If the 70′s lacked the polish of the 50′s and the fervor of the 60′s, they offered real chances as fields previously closed opened up as they never had before or would again until the digital revolution in the 90′s. But people needed a little help. A lot of small organizations and photo co-ops sprang up - Soho Photo, The Floating Foundation of Photography, Professional Women Photographers. These efforts were grass roots because they had to be – there were very few established organizations for art photographers and women photographers to turn to. It was uncharted territory: a new frontier with a new kind of pioneer. That time, the 70′s and early 80′s, wasn’t really so long ago. But looking at these letters, many typed on a typewriter with a single courier font, you realize that information wasn’t an easy click away. These women had to go after it. 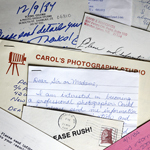 They had to read photo publications, write letters and mail them off. They had to want more for themselves – more options, more opportunities. 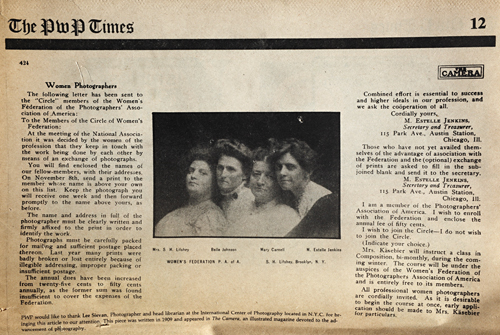 Joining a women’s photographic group was a huge step for them. But the hunger and the hope has always been there. 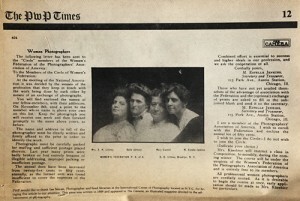 To the left is the PWP Times reprint in 1983 of a 1909 article published in The Camera. 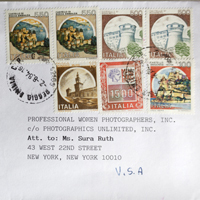 It details how members of the Women’s Federation of the Photographers’ Association of America kept in touch with each other’s work by exchanging photographs. It took more than a click, but the hunger was there. It has been there for a long, long time. At least since 1909 and probably way before.